Three Stone Engagement Ring Settings | Ben Garelick Jewelers – tagged "2500-5000"
Symbolizing your past, present and future, three-stone engagement rings are the perfect choice for your future wife and Ben Garelick Jewelers has a huge variety to choose from. The three stones can also symbolize friendship, love and fidelity and are also commonly known as trilogy or trinity rings. When worn on the right hand, they are the perfect choice for that special anniversary ring. Once considered traditional or classic, three-stone rings are making a comeback to contemporary trendiness with the presentation of a three-stone engagement ring by Prince Harry to his newly-engaged bride Meghan Markle. 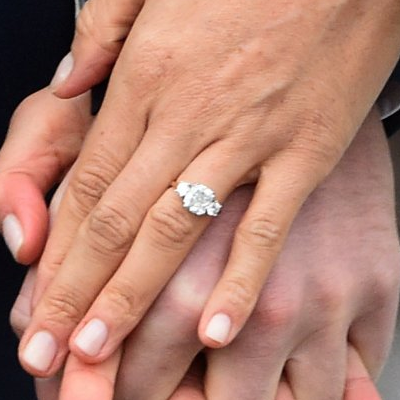 That ring, designed by Prince Harry himself, included a hand-chosen 3.00 carat center diamond set in 18K yellow gold with two .5 to .75 carat smaller diamonds on either side selected from his mother’s jewelry collection. The three-stone diamond engagement ring is a must-have in almost every jewelry designer’s collection and Ben Garelick selects only the finest designer and the highest-quality diamonds to present to our customers. Some of our most popular three-stone designs include the Cushion Halo Diamond Engagement Ring from Simon G. which features two 0.40 carat emerald cut diamonds on either side of the center diamond of your choice and 0.37 carat round cut diamonds for the halo, the "Chrysalis" 14K three-diamond halo diamond engagement ring from Gabriel in yellow gold, and the "Marlow" from Artcarved Bridal for a more contemporary look with rose gold accents. Start browsing our selection of three-stone diamond engagement rings online today and be inspired by traditional designs that Prince Harry turned to when he wanted to impress his future princess. Ben Garelick jewelry experts can show you the variety to choose from and walk you through the diamond-buying process either online with live chat or in person at our Buffalo, New York showroom. Our experts are happy to answer any questions you have when you call us at (716) 631-1584. Or check out our FAQs and see if your answer is there. We have 0% financing and layaway options available, so buy today. Can’t wait to help you select your forever ring!